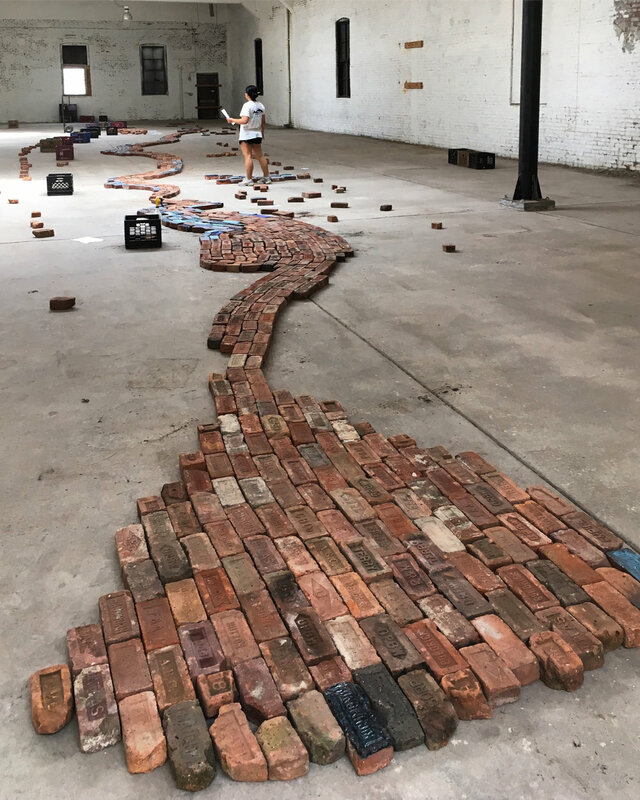 The Poughkeepsie Trolley Barn is pleased to present “Hudson River of Bricks,” an installation by Julia Whitney Barnes. The unveiling will take place on Friday, Sept. 7, as part of First Friday Poughkeepsie events. The work entails a scale version of the Hudson River, created from bricks made by more than 200 historic Hudson River brickyards each of which marked its bricks with a unique “stamp.” Though the work encompasses thousands of bricks in total, the artist glazed one example from each brickyard a range of greenish blue hues to represent the river's colors as it reflects a variety of skies. Each brickyard name and location is labeled in underglaze, then fired in a modern kiln, before being glazed and given a final firing. Each glazed brick is put in the geographic location along the river where its brickyard existed. The unglazed bricks show the patina of time and various clay body colors. New York City is one of the most iconic cities in the world and 90% of the city's plentiful brick structures (and infrastructure) were essentially created out of Hudson River mud. The installation brings attention to the rich history of bricks made in the Hudson River area, and also shows the beauty of these utilitarian objects that ceased to be produced here. Nine Poughkeepsie brickyards are included plus dozens more from the immediate area. Viewers can appreciate the work from a historical, artistic and/or local resident background. “The idea for the installation evolved over several years. Living in Brooklyn, I noticed almost daily that brick edifices were demolished, disassembled into piles and carted off to points unknown. My background is in public art and more intimate work including oil paintings, drawings, etchings, ceramic sculptures and combined media installations. As I was working on a series of paintings and drawings entitled "Bricks and Stones May Break," I began collecting bricks from destroyed buildings and defunct brickyards as reference images. Once I noticed the variety in 'stamps,' I started discovering bricks made from Hudson River clay. Intrigued that their source was so close to the city, I started seeking and exploring their defunct brickyards along the river. I found more than I expected - after two decades of New York City life, I followed these bricks back to their source up the Hudson and relocated to an Arts & Crafts home in Poughkeepsie." "The more I collected, the more interested – one might say obsessed – I became. I made painterly ceramic sculptures for almost twenty years and started experimenting with different glazes and painting techniques on the bricks. I eventually had a eureka moment that instead of pictorially painting ON the bricks, I would create imagery WITH the bricks. There are museums that contain brick collections, but as far as I've seen, no place to experience the array of bri cks brought to life in something like this installation." Julia Whitney Barnes received her BFA from Parsons School of Design and MFA from Hunter College, both in New York, NY. Whitney Barnes has exhibited throughout the United States and abroad and her work has been featured in The New York Times, Chronogram Magazine, Brooklyn Magazine, The Village Voice, Hyperallergic, and The New York Sun. She is the recipient of fellowships from Arts Mid-Hudson, the Lower Manhattan Cultural Council, Abbey Memorial Fund for Mural Painting/National Academy of Fine Arts, the Gowanus Public Art Initiative, Arts Mid Hudson and completed public art projects in Fjellerup, Denmark through funding from Kulturpuljen, Norddjurs Kommune, Denmark in 2013 and the NYCDOT Urban Art program in 2011. After two decades in NYC, Julia moved up to Poughkeepsie, NY in 2015. This massive installation is also made possible thanks to the dozens of people who gave me bricks and advised me on all things brick-related. A very special thank you to Roy Budnik at the Mid-Hudson Heritage Center, Andy van der Poel and Fred Rieck at BrickCollecting.com (an excellent resource that was invaluable to researching the history of bricks), Stephanie LaRose Lewison (her impressive collection is well documented here), Jean-Marc Superville Sovak for being my brick-brother and is even loaning me the brick-mobile-pickup last year, Lacey Fekishazy for providing the perfect location to initially install the work at Glen Lily, Mia Blas for assisting me in many things brick related, and my dear husband Sean Hemmerle who has spent countless hours digging through sludge and bugs to brick-hunt with me!!!!! In process view of the installation August 2018.